You are new today. The past is the past. It is done away with. It is over. It is gone. It is past. For those of us in Christ, we are a new creation. Not we will become a new creation. We are a new creation. 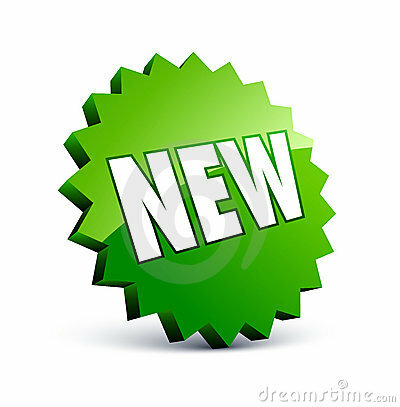 We are new. It’s not that the past will be done away with. The past is done away with. It’s not that it will be left behind us. It is left behind us. It’s done. It’s over. It’s gone. Today, you are new. Now, you may not be fully formed. You may not be perfect. You may not have it all figured out. you may not be yet what you need to be and what you will be one day. Sure, that’s all true. But, you are new. You are a new creation. You are forgiven. You are restored. You are made right. You can walk today in life, new mercy, new grace, new hope, new peace, new life. You are new today. Live new. Live with hope that comes from being a forgiven child of God today. Do you want to be healed today? That was the question that Jesus asked a man today in John 5. Jesus saw a man sitting beside a pool where healing happened. 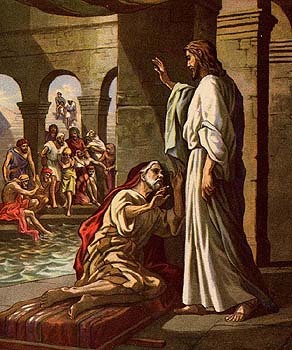 When Jesus saw him lying there and knew that he had already been there a long time, he said to him, “Do you want to be healed?” The sick man answered him, “Sir, I have no one to put me into the pool when the water is stirred up, and while I am going another steps down before me. “Jesus said to him, “Get up, take up your bed, and walk.” And at once the man was healed, and he took up his bed and walked. This man had been sitting there for many years. Jesus came to him and said, do you want to be healed. He said no one could help him. Jesus cuts to the chase. He doesn’t accept that statement. He heals him. He restores him. He helps him to become whole again. The same Jesus comes to us today and asks us the same question. Do you want to be healed? Now we may be facing a physical situation that has no easy answer. We may be facing and emotional or spiritual situation that has no easy answer. We may be dealing with things that aren’t easy to fix. That are challenges. That may take lots of work, tears, prayers, and faith. Our life may be full of these types of challenges. But, listen to the question that Jesus asked this man. Do you want to be healed? Do you want to be whole? Do you want to be restored? You can be. By Jesus. He can make you whole. Even if He doesn’t “heal” you. You may still have you physical challenges. You may still have your emotional challenges. You may still face trials, trouble, and worries. But, you can be healed today. You can be made whole today. You can be restored and renewed today. Through Jesus. In Jesus. By Jesus. Today. Today, do you want to be healed? Today, may each of us find that new life in Jesus Christ! If you’re like me, sometimes you enter into your time of prayer weary. I come before God with the list of all the things I’ve done wrong. . . . .
All the ways I’ve not loved Him with my whole heart. . . . .
All the ways I’ve not obeyed. . . . . . The the ways that I have done wrong. . . . .
It’s easy to just enter into prayer heavy. Thinking to God, there’s so much more I ought to be doing. There are so many things that I shouldn’t be doing. Oh God, I’m not who I ought to be. I think that’s the thing that stops so many folks from praying. Just that knowledge, that shame, that, whatever it is. So today, I read these words from Paul in Romans 8. And, wow. Just listen to what Paul says. 37 No, despite all these things, overwhelming victory is ours through Christ, who loved us. 38 And I am convinced that nothing can ever separate us from God’s love. Neither death nor life, neither angels nor demons,[a] neither our fears for today nor our worries about tomorrow—not even the powers of hell can separate us from God’s love. 39 No power in the sky above or in the earth below—indeed, nothing in all creation will ever be able to separate us from the love of God that is revealed in Christ Jesus our Lord. Did you hear that? Nothing, nothing, nothing in all of creation can separate you from God’s love today. Nothing you’ve done. Nothing you’re doing. Nothing you’re going to do. Even if you’re as good as you’d like to be. Even if you’re not as faithful as you’d like to be. Even if you’re not doing everything exactly as you ought to be doing it. Today, don’t live like an abused servant. Live like a loved child. That’s what you are. You are a loved child of God. 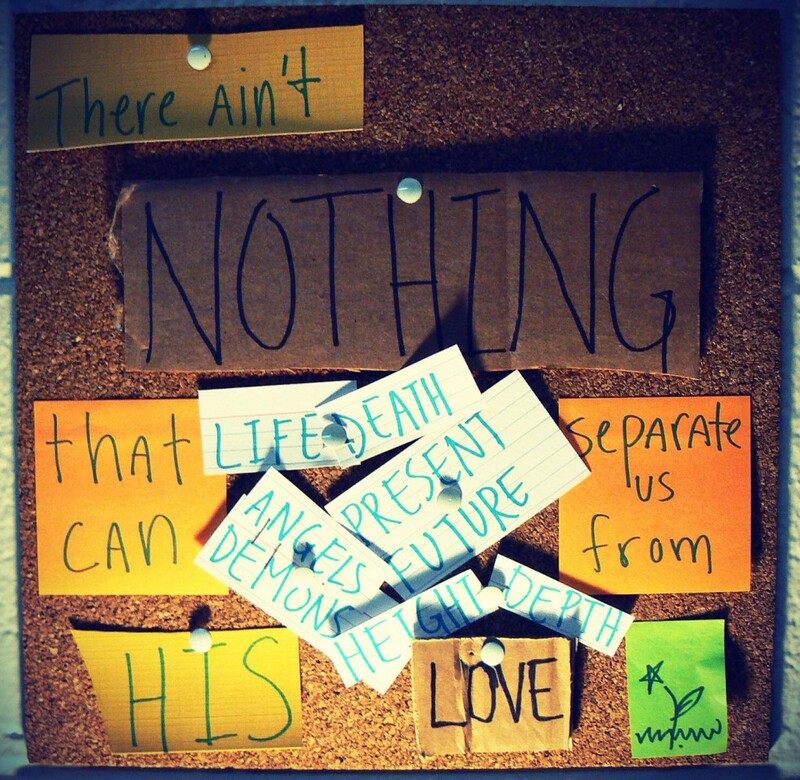 Nothing can separate you from God’s love today! Live with joy, with peace, with freedom. You are loved! Let go of your burden. Live light! Live in the light of God’s love and forgiveness. Nothing can separate you from that love today. Wow. Live in that knowledge. One of the things in life that is most disheartening, to me at least, is when folks feel like giving up. When people feel like their is no hope. When we lose that sense that things can get better, can change, can be different. In short, when people want to give up. When people think that there is no reason to hope. We hear, oh, but things can change. Things can be different. It doesn’t have to be like that. And, when we are broken, we say – impossible. That can’t happen. It won’t change. Things don’t have to be the same. They don’t have to be like they’ve always been. I know it’s Monday, and we hate Mondays. 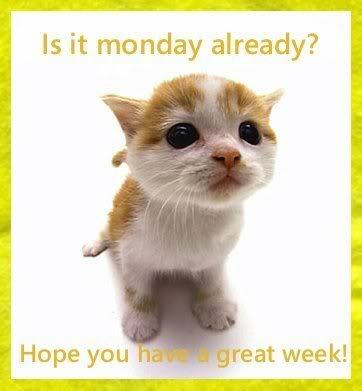 But this Monday, this Monday is a new day! Each day is a new day. Each day, through faith, we get to start over. Each day is new. Full of new life, new hope, new grace. This is a new day. It does have to be like a aways. Things can change. Things can be different. It isn’t impossible. Now, through ourselves and our strength, yeah, nothing will change. But, through God. Through faith. Through grace. Through His life, things can change. Things can be different. There is hope. There is life. There is a change for a new start. Today, yes even today. Even this morning. There is a chance for a fresh start. Things can be different. Things can change. Nothing is impossible. Mondays are awesome! Through God’s grace, each new day is awesome. Go out and live a fresh, new, loved life. For today is a new day. Nothing is impossible for God.